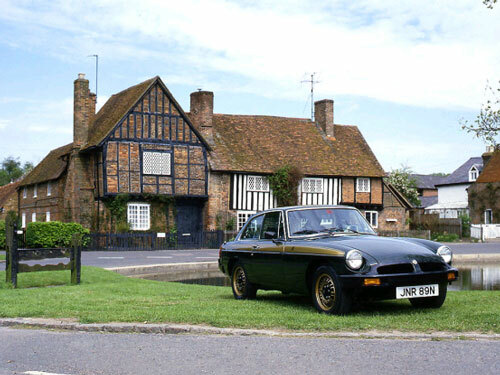 In May 1975 Abingdon produced 750 specially prepared MGB GTs to celebrate what British Leyland thought to be the MG Car Company's fiftieth anniversary of the production of MG Cars. However as MG historian Wilson McComb points out in his book 'MG by McComb' they got the date wrong as they were actually in their fifty second year of production! These cars were based on the 'black bumpered' MGB GTs introduced in December 1974 to conform to the requirements of the American safety standards. MG were the first British manufacturers to produce a vehicle to meet the new Federal US regulations on impact absorbing bumpers and exhaust emission control. These regulations stipulated that a 5 mph impact should cause no damage to the safety related systems such as lights, brakes, steering etc. The Californian State regulations were even more stringent and as this was the prime market for MG there was no alternative but to comply. The Californian regulations stipulated that no damage whatsoever should be caused in the event of a 5 mph impact. The result of these regulations meant that substantial steel beams were fitted to the front and rear of the car braced by stiffening struts incorporated into the body structure. Mounted onto this massive framework were black moulded polyurethane bumpers, which were designed to absorb the effects of a 5 mph impact and then recover their normal shape afterwards. In many enthusiasts eyes this ridiculed the classic lines of the GT and to add insult to injury the ride height had to be raised by 11/2" to make the bumpers effective. This not only lessened the car's sporting appeal but also adversely affected the handling by producing a lot of body roll and oversteer. Coupled with the fact that the car was now some 70 lbs heavier and 5" longer, it was not as desirable initially as its predecessor the 'chrome bumpered' MGB. This was a classic case of legislators concentrating their efforts on reducing the risks of personal injury at the expense of making the vehicle more accident prone. In the process of adhering to the American regulations that had spoilt appearance and roadholding, the performance was also markedly affected with air pollution controls becoming a lot more stringent. The North American specification MGBs were detuned with a reversion to the original small valve cylinder head and a single Zenith Stromberg carburettor in place of the twin SUs, together with a highly restrictive air cleaner that made the car particularly sluggish. In addition to all this, the Californian specification cars were fitted with a catalytic converter to reduce the levels of carbon monoxide emitted into the atmosphere. The Californian Authorities as always were further advanced than the rest of the States with their pollution requirements and as a result the MGB had to carry additional weight and a power loss of some 25bhp. Non-American models were spared the indignity of the drastic engine strangulation, but the other suspension and body changes were implemented to keep production costs down. Further changes to the MGB and GT brought them into line with the MGB GT V8 with the fitting of a collapsible steering column together with corresponding column mounted stalk controls and V8 type instrumentation incorporating smaller tachometer and speedometer. Door mirrors, hazard warning lights and brake servo became standard fitments and the previously optional Laycock D type overdrive with its 3.13 overall ratio was changed to the later LH unit, with a 3.2 overall ratio becoming standard in June 1975. Twin 6 volt batteries were abandoned in favour of a single heavy duty 12 volt battery but it was still mounted in the well behind the front seats. Moves were made to improve the roadholding in the summer of 1976 due to a high level of complaints resulting from the increased ride height. This was effected by fitting a rear anti-roll bar and a larger diameter one at the front. This did improve things considerably but some fast drivers found that they could lift a rear wheel on hard cornering. The fitting of the new rear anti roll bar meant that the fuel tank had to be redesigned to accommodate it, this made the tank smaller thus reducing its capacity by approximately one gallon. Several other significant changes carried out at the same time involved the part redesign of the interior taking account of some of the niggling problems never rectified during the 14 years of production. This involved moving the overdrive switch to a gear lever mounted position for ease of operation and the brake, clutch and accelerator pedals were remounted to make proper heeling and toeing possible. A smaller 15" diameter PVC covered steering wheel was fitted, with padded spokes making an 'H' pattern conforming to safety regulations, at the same time the steering rack ratio was increased from 3.5 turns lock to lock to 3.0 turns to compensate. Type: 4 speed all synchromesh. Overdrive of 3rd and top. Brakes: 10.75" dia disc front; 10' dia drum rear with servo assistance.